I'm not a huge comic book fan. Not because I dislike the medium - I think comics can tell some amazing stories - but because they can hook you into an obligation to buy more and more as your understanding and interest in the universe grows. Marvel has a huge line of comic titles stretching back decades, and it is really easy to lose track of what is going on with your favorite characters. Because of this, I think Marvel Studios took a calculated risk when they decided on Guardians of the Galaxy to be their grand introduction to the greater, off-Terra setting that is the Marvel (Cinematic) Universe (aka, the MCU). Would the non-geeks understand what was going on? Would they have interest in the characters? Would it tie together with the previous movies in a meaningful way? Would audiences accept a talking raccoon with a machine gun and a walking plant-man as heroes? Thankfully, I think the answer to all of the above is a resounding "Yes!". This was an extremely well-crafted film, carefully designed to ease an unfamiliar audience into the vast, epic scale of the MCU. Starting on Earth in 1988, we meet the young Peter Quill on the night his mother dies of cancer, and Peter is abducted by aliens. We then fast-forward 26 years, to a dead planet, where we find Quill, now an artifact-hunting thief who (unsuccessfully) goes by the moniker of "Starlord". Smartly, the filmmakers tie the young boy to the man he's now become with one simple connection - the Walkman he had with him when he was abducted. Even if you were completely oblivious to the pre-screening promotions and knew nothing about Quill, the simple act of him putting on the headphones ties us back to that young boy on Earth, and we know just what's going on. As an aside, the Walkman also serves as the instrument through which one of the movie's best features is presented - the soundtrack. For the last 26 years, Quill has been listening to "Awesome Mix Vol. 1", the cassette in the Walkman when he was abducted. It's full of great music and these tracks are used perfectly throughout the film, also providing a diegetic source for the soundtrack (a trick I usually really enjoy when done in a clever manner). The plot of the story is actually pretty simple. Quill steals The Orb from the dead planet, and it turns out Ronan (the Big Bad Guy) wants it to do Bad Stuff. Ronan chases Quill and his ragtag band of unexpected allies across the galaxy. Will the Guardians figure out how to stop Ronan before he blows up the planet Xandar? Take a guess, hotshot. But while the plot is very basic, I think it serves as a good means of introducing the vastness of the MCU. You don't have to worry much about following a twisty-turny plot with complex character arcs, in addition to trying to figure out what the Kree Empire is, or who the Ravagers are. The information is delivered in succinct, bite-sized pieces, easily digestible by folks such as myself who couldn't tell you the difference between the Kree Empire and the Nova Empire if we tried. This is probably a good time to mention another really strong aspect of this film - its great sense of humor. There are funny moments in all of the Marvel films, but GotG is the first to come across as a borderline comedy. There are moments which are laugh-out-loud funny, mostly orchestrated by Chris Pratt in his role as Peter Quill, but also Rocket Raccoon, the all-too-literal responses from Drax, and even the straight-man comments from many of the other characters. 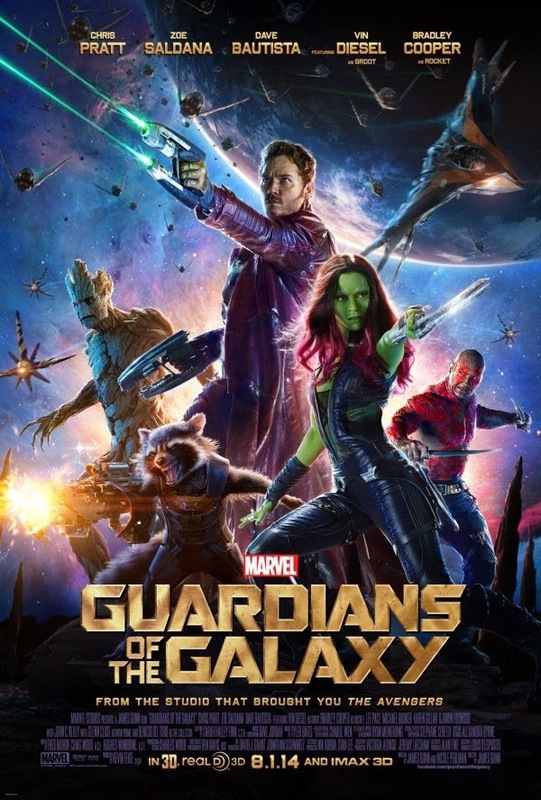 I don't think any of the other Marvel movies would have been able to get away with dropping "turd blossom" in the middle of a deadly serious moment and have it work, but GotG pulls it off in a way that feels natural to the spirit of the film; it is a rollicking adventure ride through space, filled with gun battles, spaceship fights, fisticuffs, madcap hijinks, and more than anything else, a great sense of fun. I've seen every film in the MCU lineup multiple times now, and Guardians of the Galaxy is easily the most "fun" film of the lot. I think that was a deliberate choice by Marvel (given a film with a trigger-happy raccoon, this makes sense), but it would have been all too easy for the fun-factor to come off gimmicky or forced.Thankfully here, that is not the case at all. In conclusion, if you like fun, fast-paced sci-fi adventures, and/or you're a fan of the Marvel Cinematic Universe, I think you'll enjoy Guardians of the Galaxy. I will definitely watch it. A bit different on the superhero front. I loved it too. Love the sci fi, space opera stuff. I liked it so much I went back to see it a second time in the theater and I can't remember the last time I did that. And I paid full price the second time to see it. Yeah, it's THAT good.